Bed of rice topped with layer of thinly sliced cucumber, then some canned roasted eel and more cucumber. Pickled Daikon sunflower with eel center. 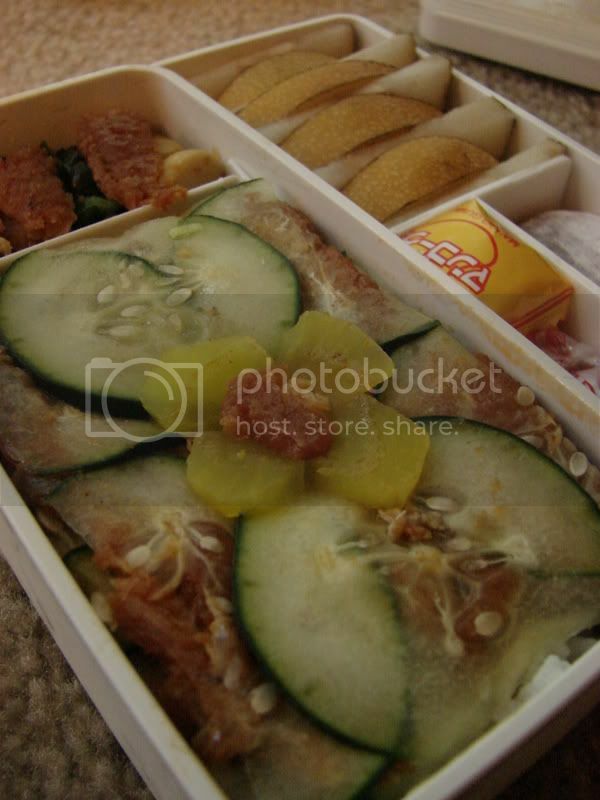 In the side compartment is assorted pickles and small sticks of cucumber with more eel on top. Top tier: Sliced Asian pear, rice cake, candy. Leftover fried rice, Cherry tomatoes hollowed out and stuffed with spicy tuna (canned tuna, siracha chile sauce, soy sauce, sesame oil, black pepper, red pepper flakes, garlic powder, powdered ginger), cucumber flowers and edamame salad from a friend. Pickled radish decorations. 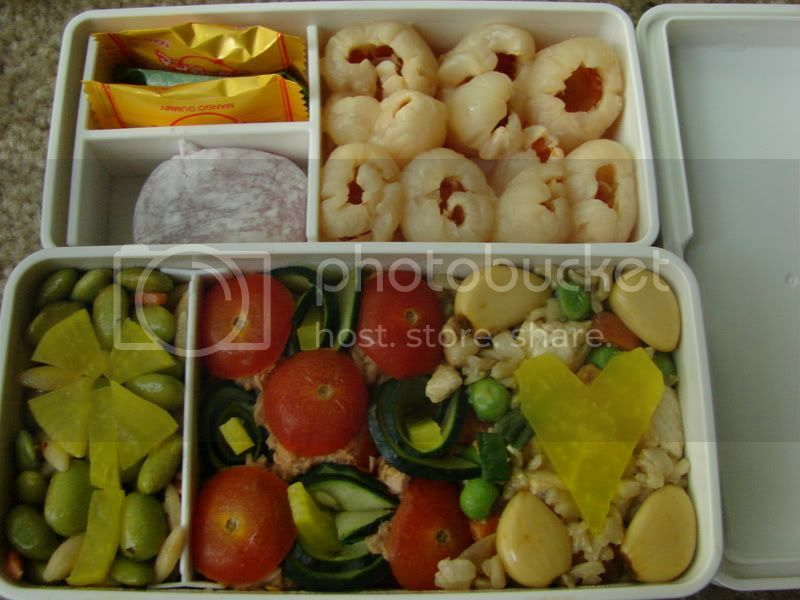 Canned Lychees, rice cake and mango gummies. 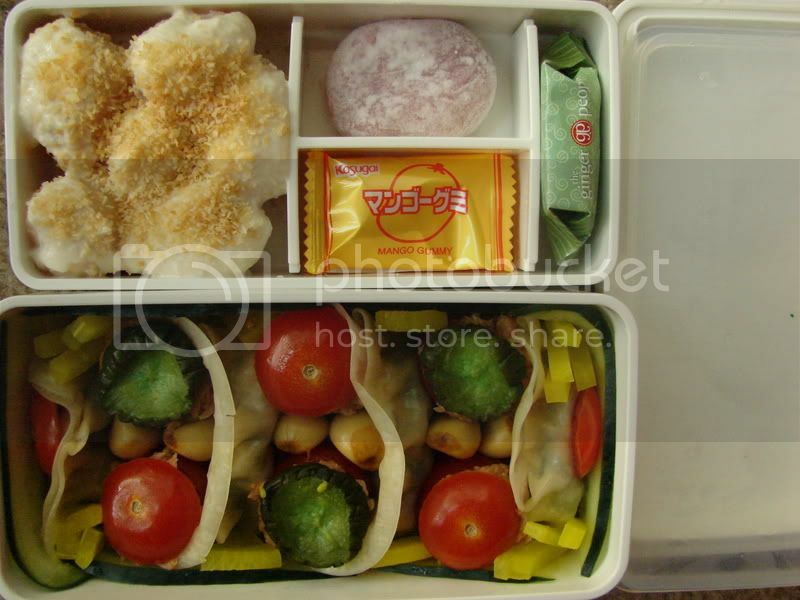 Vegetable gyoza, spicy tuna stuffed tomatoes, cucumber surround, springs of daikon filling in gaps. I got all experimental with my lychees. They were just asking to be stuffed, so I raided my fridge and cabinets and came up with a toasted coconut, cream cheese, fresh ginger, yogurt, key lime filling concoction. It's pretty good. adds a bit of tartness and creamines to the lychee's super-sweetness. Also, another rice cake and more candy. I had a pretty bad night preparing this one. I burned the rice. BAD. And I was trying to make an omlet like this, but my pan is crap, the heat wasn't high enough and I thought I'd subsitute rice wine vinegar for mirin. So I ended up with weird looking scrambled eggs. They taste pretty good, though. Bed of rice (I was able to salvage a little...tastes kind of smokey), pickled daikon and tomao sunrise, scrambled egg clouds and pickled garlic ducks swimming on a lake of Wasabi Fumi Furikake. 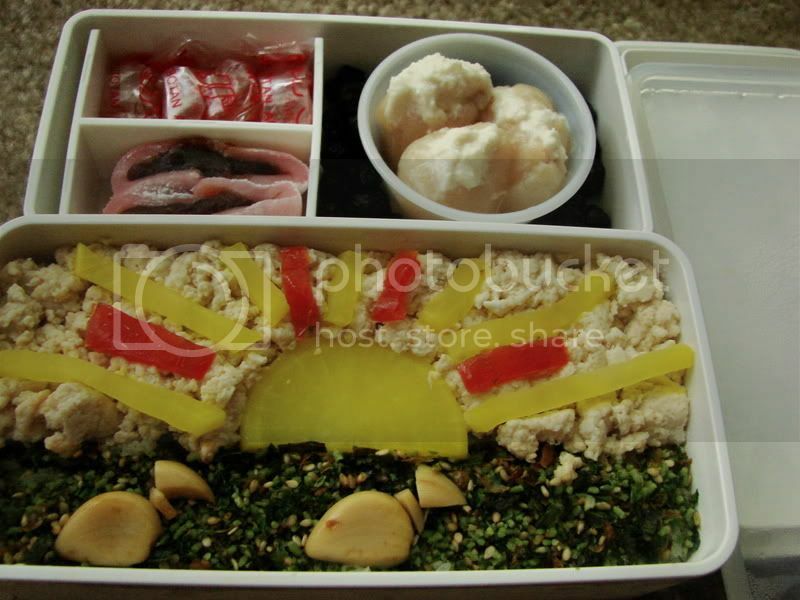 Top tier: Stuffed Lychees (same as thursday's), dried blueberries, rice cake cut in half, botan rice candy. So pretty! There must be something in the planets making us burn rice lately. It's an epidemic. Oooo....fancy! I can't wait to put together some lunches!